And with its passing the country has lost its oldest warhorse, and the Leicestershire Yeomanry has lost a faithful animal which had endeared itself to the unit. This grand old veteran of the 1914-1918 war, passed away in retirement at its home at West Beacon Farm, Woodhouse Eaves January 1940, and by a strange coincidence, the horse's last minutes were spent in the company of an old Yeomanry companion, R.Q.M.S. "Fred" Hunter, who, on leave from his unit, called at the farm on a surprise visit. "Songster" now lies beneath a mound. His exemplary service in the Great War brought many decorations from the Leicestershire Yeomanry, and there are hopes that "Songster" may yet be mentioned in official orders. Purchased from Spelman's the London horse repository, in 1919 by Mr. Bert Main, a trooper in the Yeomanry in the last war, "Songster" has since, until retirement a few months ago, been in use by ex-Squadron Sergeant-Major Harry Poole, of West Beacon Farm. Many years ago a handsome chestnut, "Songster" had recently betrayed his estimated age of 40 years by his gray coat. Where the horse came from no one appears to know, but it was mobilized with other horses in Loughborough Market-place on August 4th, 1914, and was taken to France with the Yeomanry in November 1914, with Trooper Bert Main in the saddle. There are many stories of "Songster's" achievements. With Trooper Bert Main up "Songster" cantered to victory in a cross country race in France, but a more remarkable story concerning the horse is of its ability to climb stairs. On many occasions "Songster" was ridden by Trooper Main up the stairs leading to the clubroom at the Old Boot Hotel, Loughborough, and after walking proudly round the room the horse would achieve the even more difficult task of descending the stairway.Today on the brass rods of the stairs there are indentations credited to "Songster's" hoofs. "Songster" returned to England in 1919, and, having been notified the horse would be brought up for sale at Spelman's (London). Mr. Main purchased it and it was taken to West Beacon Farm to be placed in harness by ex-Squadron Sergeant - Major Harry Poole. 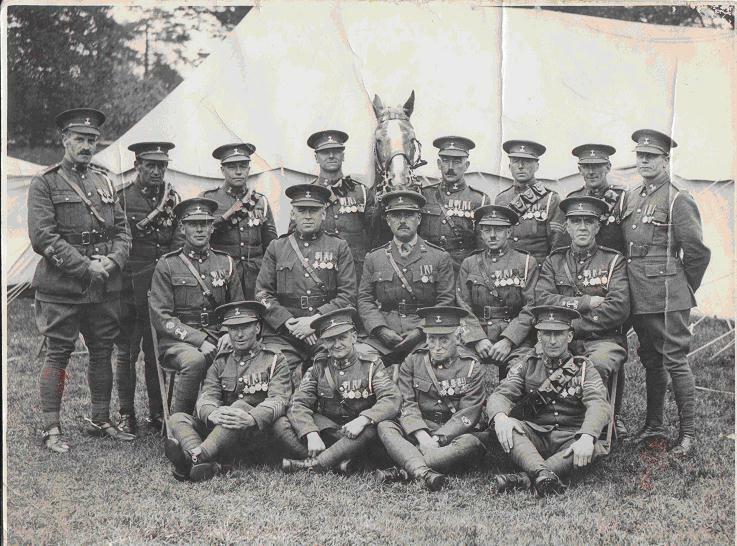 But its Leicestershire Yeomanry connections were not severed by this transfer, Songster" had not had time to forget the meaning of the bugle calls it was claimed he understood before he was clicking his heels to the sound of the band en route for camp in 1920. The unit's annual camp claimed "Songster" until 1935 when although leading a more leisurely life; "Songster" continued to make his weekly appearance in Loughborough, drawing a float to Loughborough Market. "Songster" a gelding some15 hands, passed away peacefully and it is stated, without the slightest suffering. To the little company of Yeomanry comrades gathered around the animal were a sad parting. There were tears in their eyes, when upon a barn door they carried the horse into the stable for the last time. "Songster" had never experienced a day's illness in his life and at the time of death the animal's feet were in sound condition. R.Q.M.S. Hunter, together with Troop Sergeant -Major Pepper called at West Beacon Farm at the conclusion of a days shooting and it was while enjoying a cup of tea they were told by Mr. Poole. The old pony's dropped down and I can't get him up. The old veteran had collapsed some 50 yards from the comfortable stable. A barn door was taken off its hinges and with tender care "Songster" was rolled over on to this and carried into the stable where he died at 9 o'clock that evening. R.Q.M.S. Hunter said that just before the old horse died it looked at him as much as to say "I am done." He is buried in the field he has grazed in for so many years. "That horse knew every trumpet call. It was one of the finest I ever saw in the last war." R.Q.M.S. Hunter said. 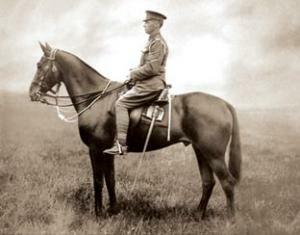 Upon the horse's head in the rough grave excavated for it, the ribbons and medals were placed with solemn dignity. These were, two Mons stars, and General Service Medal, the Victory medal, and two Territorial Long Service medals, which with ribbons had been awarded the horse by the Regiment. 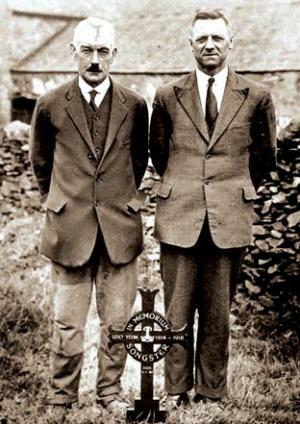 Harry Poole and Bert Main standing over Songsters grave.